Resistivity measurement using Microwave Frequency Q-Meter with Single Post Dielectric Resonator (SiPDR). SiPDRs are intended for the measurements of the surface impedance of metamaterials and resistive films as well as for the contact-less measurements of the conductivity of semiconductor wafers. Range of thin film materials that can be measured includes resistive layers, thin metal films and conductive polymer films with the surface resistance Rs < 20 kΩ/square. 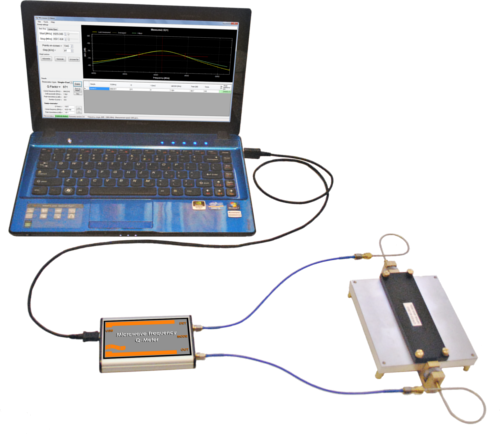 Use of inexpensive computer controlled microwave oscillator system, Microwave Frequency Q-Meter, enabling quick and automatic measurements of permittivity, dielectric loss tangent and resistivity with a dedicated SPDR or resistivity and sheet resistance with a dedicated SiPDR. Microwave Frequency Q-Meter connected to the SiPDR and to the computer. 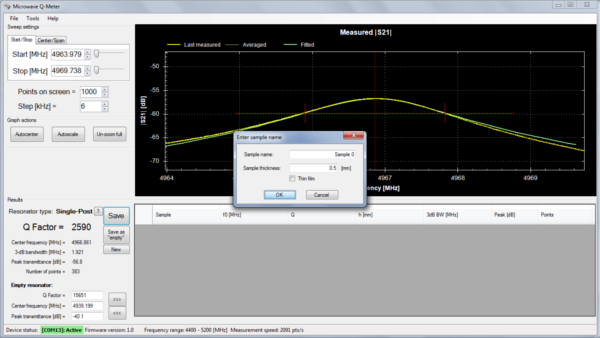 Dedicated application allows controlling measurement process and enables easy management of the measurements results. To determine resistivity, only two measurements should be performed. The first one, called reference measurements, is performed for empty resonator. 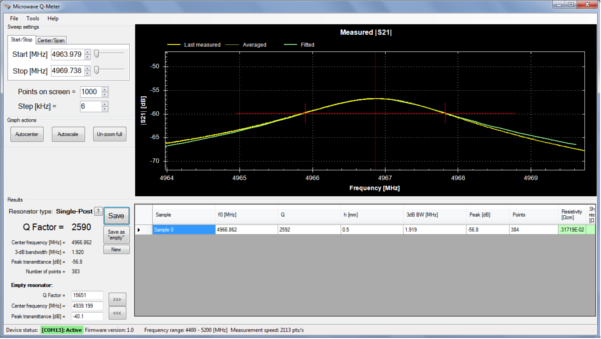 The second one - for resonator containing test sample. The only external information is the thickness of the sample under test. The measured resistivity will appear in the green column. Range of resistivity measurements for the SiPDR: 10-5 ÷ 103 Ωcm. Read more about permittivity, dielectric loss tangent and resistivity measurement using Microwave Frequency Q-Meter with Split Post Dielectric Resonator (SPDR). Read more about sheet resistance for thin films measurement using Microwave Frequency Q-Meter with Split Post Dielectric Resonator (SPDR) and Single Post Dielectric Resonator (SiPDR). Read more about Resistivity and Surface resistance Measurements of Semiconductors and Conductors (pdf file, 2 MB).